This book is being bought in order to be translated into Portuguese here in Brazil. I already got the Spanish version at a course in Argentina and find the contents very inspiring. More than one old student has also commented favorably on this book. 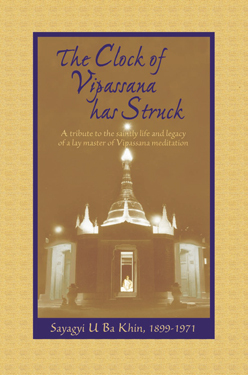 As with other books at sale at Pariyatti, the wisdom contained in The Clock of Vipassana helps us to take our meditation more and more seriously and gives us more and more hope of one day making it to the final goal. This is a great resource, and a very enjoyable read. Made me appreciate how much we owe to the courageous men who brought Vipassana out of the monasteries and to us layfolk!